Nightingale 9 is located on the same side of the street as Seersucker and Smith Canteen, which sorta looks like he’s playing foodie monopoly. It felt like walking into a school cafeteria in a third world country. Small tables and rustic metallic chairs. 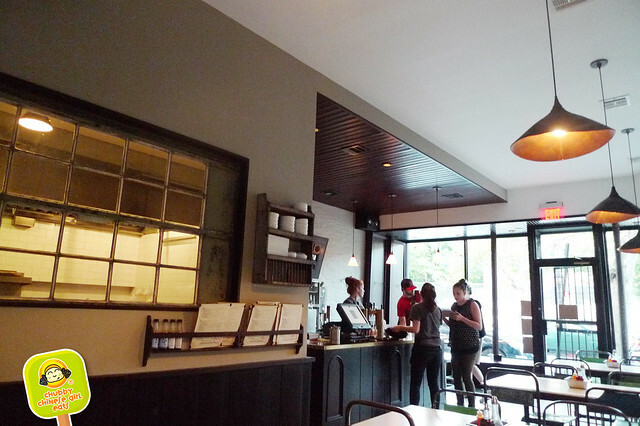 Of course, in a more hipster, Brooklyn sense. Drinks wise, they were small and not very boozy. 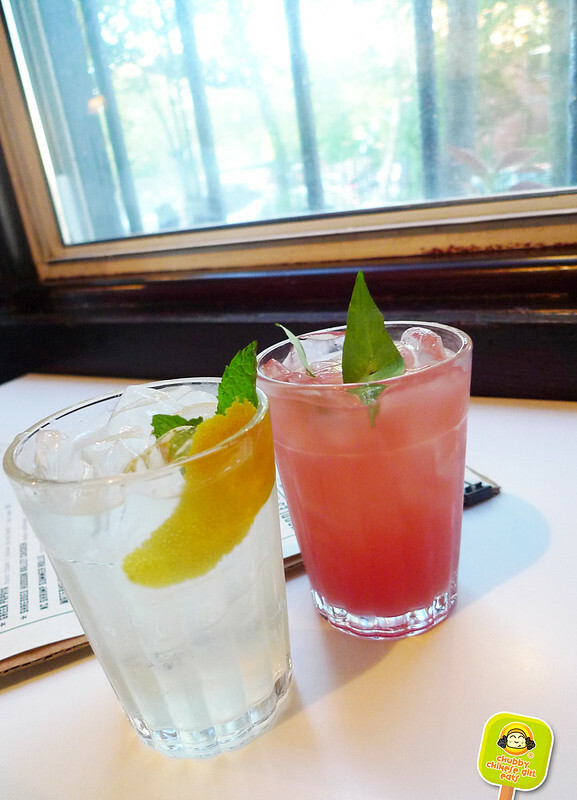 I got a fruity white sangria with yuzu and StalkerBoy got a watermelon one. Both tasted more like juice than anything. And you know I measure booze level according to how red my face turns and in this instance, I was pale as a ghost. They weren’t cheap either. Boo to that! 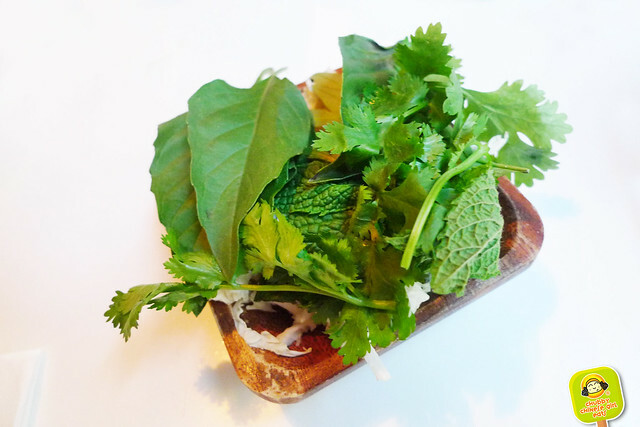 A medley of fresh herbs was present at all times. To snack/enhance the dishes that followed. Curry flavors were way to strong for me, but StalkerBoy enjoyed them. Great summery dish with shaved squash, the freshness of cucumber, chard flavor from the grilled corn, both sweet and savory. A ton of flavor from fresh basil. 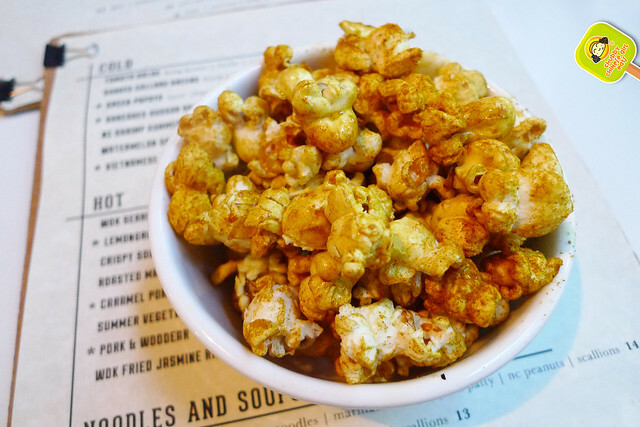 There’s a tartness along with a spicy, smokey kick. Seersucker’s fried chicken is my all time favorite, so I knew I was in for a treat. Chef Newton knows how to fry a bird. All hands here. You first pull the meat off the bone and squeeze fresh lime into the spices, salt and pepper mixture. 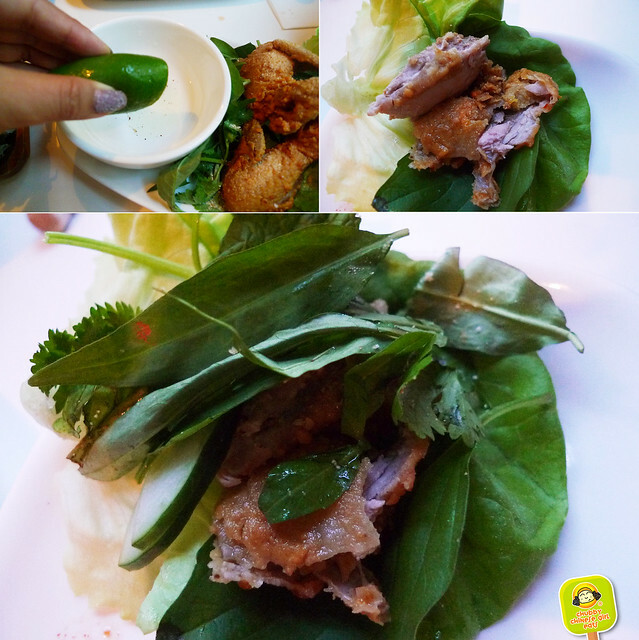 Wrap the meat in butter lettuce with all the herbs and cucumber, followed by a dip. So good. There’s roasted rice powder in the mixture, which gives it a nutty flavor. The quail is ultra juicy and though small, the meat is really flavorful. The crust is well seasoned, crispy and crunchy. It’s a mouthful of bright flavors, one after the other. 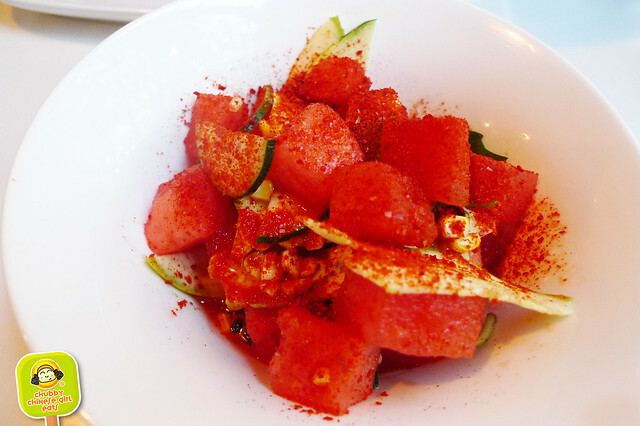 And that lime dip really brought it all together with tartness and adding a kick. Loved it and would definitely go back for more. 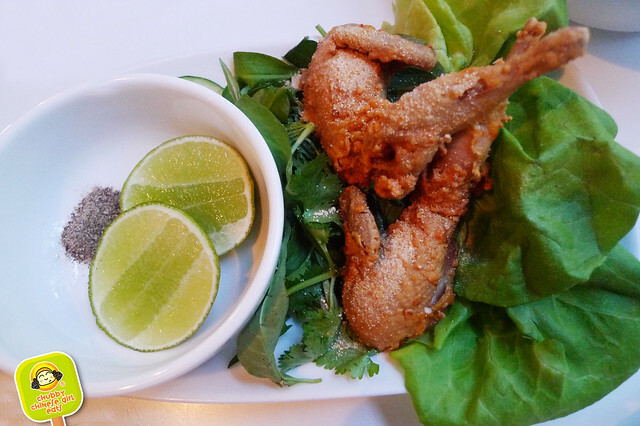 Fried quail should be the next big thing. I would love it served bucket size. A fun mix of very familiar veggies. There’s a spicy lemongrass broth in the background. 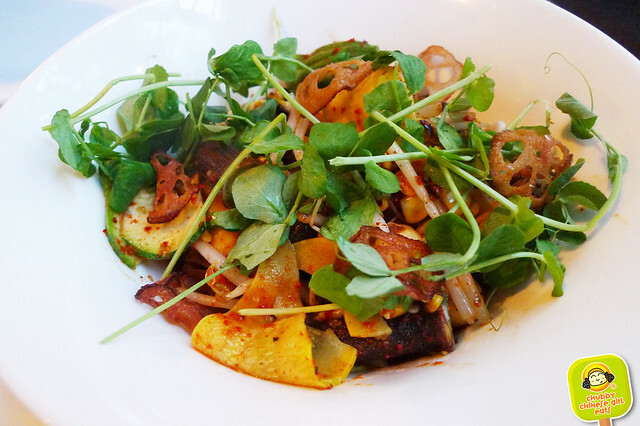 Amongst the zucchini, bean sprouts, okra and fresh snow pea shoots, there were crispy lotus root chips. A nice hint of wok flavor was present. Great over white rice. What stood out the most were these lotus seeds. Chinese people usually have it in soups or desserts. My first time having it outside of Chinatown. A nice surprise. It was cooked tender and not too mushy. It has a distinct sweet/bitter after taste. According to my ChubbyMama it’s very good for you (What? I don’t know. but if she says so). 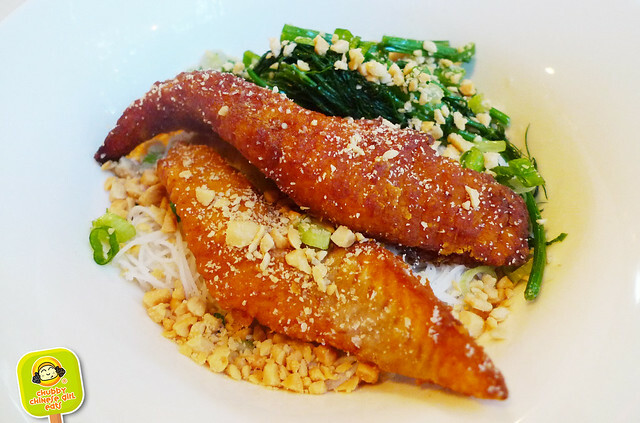 Perfectly fried, tender and moist catfish with rice noodles, a hint of dill, scallions and peanuts. 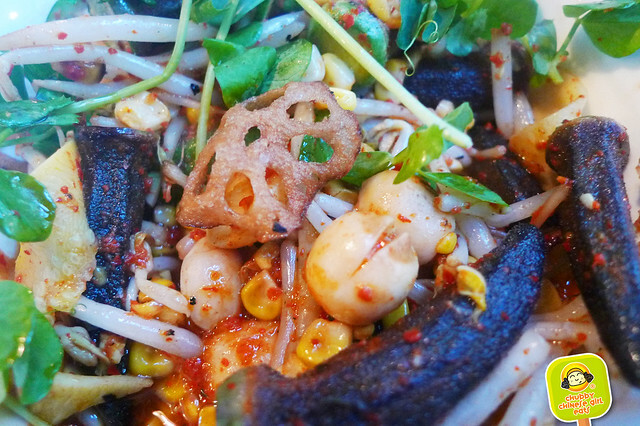 Though the catfish was flavorful and good, the star of the show were the rice noodles. It had a really toothsome pull, yet remaining soft at the same time. A dash of fish sauce, sweet and tart flavors combined it all together. Very familiar and easy to enjoy Vietnamese flavors. The dill was a nice touch. 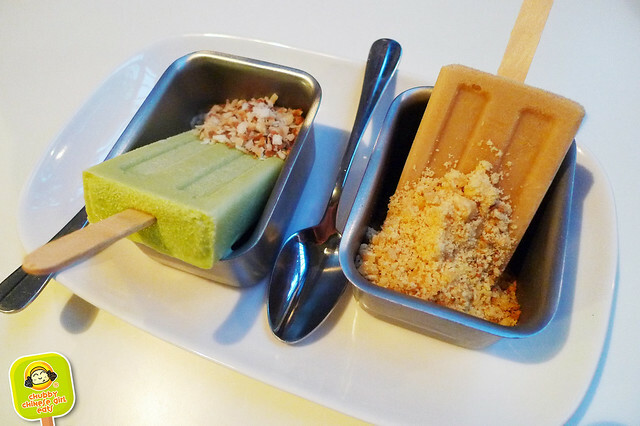 For dessert, the folks at Nightingale 9 treated us to some complimentary popsicles. They are $5 each on the menu. I couldn’t have asked for a more whimsical and sweet way to end this fun meal. 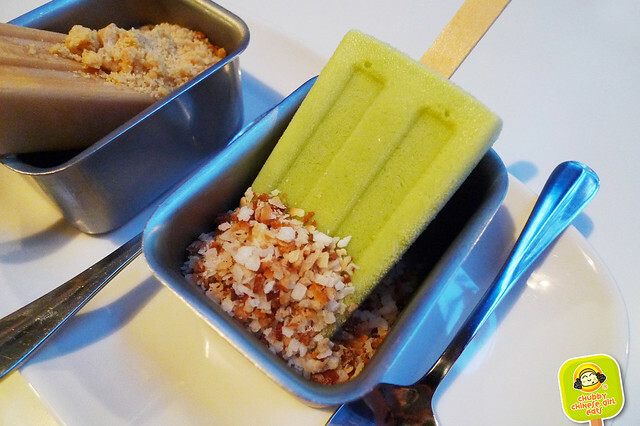 Popsicle for a more adult palate. Really bright with a sweet grassy finish. In between a creamy and icy consistency. I loved dipping them in the toasted coconut, for a play in texture and flavor. 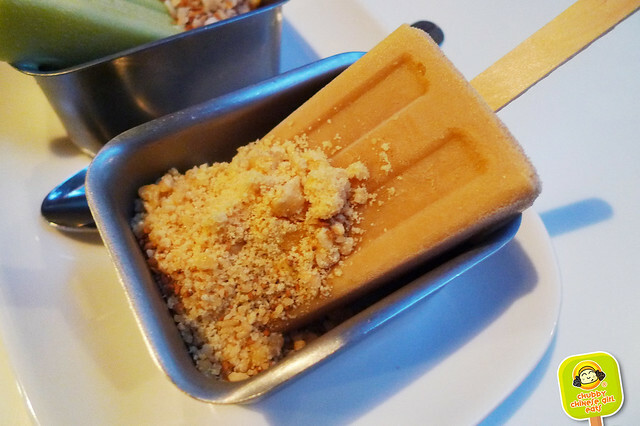 Unlike the brighter Thai basil popsicle, this had a rich caramel like flavor. That nice burnt sugar/molasses sweetness with a dip into what seemed like a Asian “brittle” with peanuts and sesame. So good. Overall, I thought our meal was great with a few surprises. And though prices were higher than your usual Vietnamese place in Chinatown (which I do love), the food is definitely worth a try. 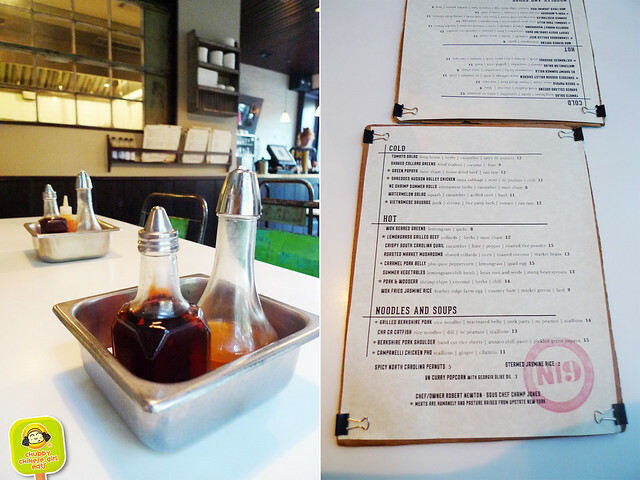 Familiar flavors with a dash of Southern from the chef’s background. I would definitely be back for that fried quail! Drinks wise, I would skip. More like 3.75. The quail alone was def a 5.